The displacement sensor of the three-roll crusher is broken and detached due to its external metal sleeve, thereby damaging the displacement probe inside the sensor, resulting in inaccurate gap measurement and malfunction of the equipment. The main reason for the damage caused by inspection and analysis is that the vibration is large and the wear is fast. For this reason, two steel plates can be welded on both sides of the bracket as ribs to reduce vibration, and the effect is good. ① Adjust the original setting value related to the PLC program and add a working delay to the solenoid valve. ② Adjust the oil temperature linkage value. ③ Replace the damaged air switch and other components. The main reason is that there are many large-grain materials, overload operation and frequent parking. After the replacement of the corresponding damaged parts is reset, it works well. In this regard, it is necessary to stabilize the working conditions, optimize the operation, reduce the number of stops, and ensure the smooth operation of the device. The main reason for the damage of the triangular transmission belt: First, the local accumulation of material and crusting in the belt groove of the transmission wheel, and it is more practical, which often causes the belt to stand sideways and turn over; second, the old and new belts are mixed (6 sets of each belt) Damage is not a complete replacement. Since the original design of the conveyor belt cover is a whole, not only long, high and heavy, it is quite troublesome to replace the V-belt. In this regard, the shield can be divided into two parts, and a hand hole is opened in the upper part to facilitate the replacement of the V-belt and the cleaning of the accumulated material in the belt groove. 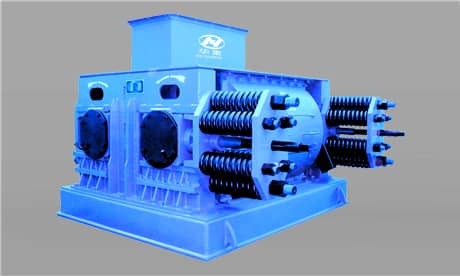 Previous Article：How to choose the Type of Cone Crusher?